Bob and Mike Otto have been building and renovating lakes 40-years. If you’re considering such a project, contact our office and acquire their books. They cover all topics from site selection, soil analysis, and potential obstacles to stocking and managing fish. Valuable recommendations will make it an informed and cost efficient experience. Is there enough watershed drainage to fill the lake? Should the lake have some kind of pipe outlet system? If so, what kind and how big? How much maintenance will the lake need when completed and for how long? How wide should you build the road across the top of the dam? What are the best fish to stock in a half-acre pond? Are there any fish you cannot stock in a 10-acre lake? How much will the water go up and down from season to season? How much rainfall do you get in a year and how much do you need to flow into your pond? What kind of dock do you need and how big should it be? What about a boat ramp? 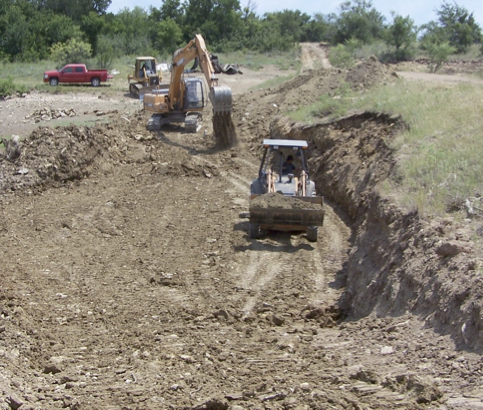 Do you need to worry about flooding an underground pipeline easement? How big can you build your lake before you need legal consultation? What kinds of permits are required? Do you need grass on the dam? What should you do to keep your lake from filling with dirt? How can you remove silt after it builds up? What do you do with silt after its removed? What angle should dam slopes be? What about livestock and wildlife? Why in the world are you building this dadgum lake anyway? 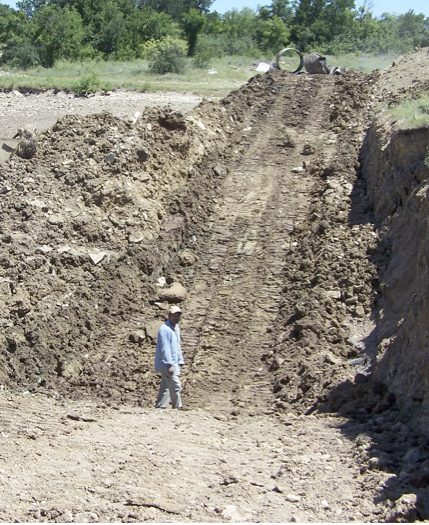 Learn about dam core trenches. Both agree it seems like a lot to think about, but remind it’s not. It’s just that when you are preparing to move any part of the earth, it always deserves careful thought. When dirt is disturbed, it cannot be the same again for years. And, if you are building a lake, you are completely changing the existing habitat for generations to come. What you don’t know can hurt you and a lot of other things. So, where do you go for help? Go where you find it. Mike acknowledges that sounds like a flip answer, but it’s true. One thing he’s learned about the consulting business, most consultants know a lot — about what they know. But, what they know may not be exactly what you need. His advice, study different sources. Also, visualize your project as much as possible, so you can pass your vision to those you surround yourself with for help and support. POND BOSS magazine is a great resource. Both books are available at www.pondboss.com. While there, click on “Ask The Boss”. Find people who have done what you want to do and get in touch with them. Interview other pond owners. Learn from their successes and failures. The Natural Resources Conservation Service office in your county can be quite helpful and is a great place to start gathering information. They know soils and have engineering ability. There’s an NRCS office in almost every county. Check under federal offices. While this agency is quite qualified to engineer and oversee construction of a dam, they may not understand your bottom-line usage. If you are building a fishing lake, seek a professional who knows about underwater habitat, structure, and cover. If you want a swimming hole, contact that expert. Thoroughly test soil for clay content. The first important step is identifying goals for the pond. 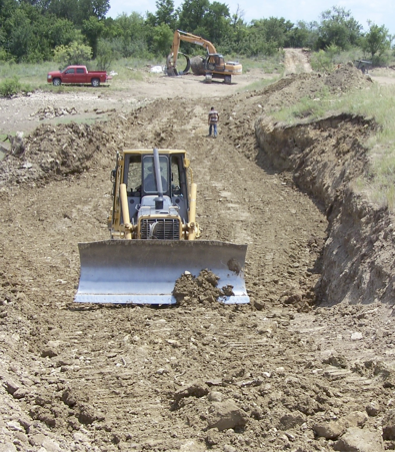 Private engineering firms or excavation contractors can help develop plans. Some office supply stores sell topo maps or aerial photos and they’re available on-line. Levels must be used regularly to focus on the water line and dam height. There’s almost always unexpected events. Surround yourself with maps, aerial photos, people with engineering experience, lake designers, fisheries pros, and excavation contractors. Plan carefully, do you homework, and expect the unexpected. You will glean enough to design and build your dream lake. Then just add waterto have the perfect pond. This entry was posted on Tuesday, January 15th, 2019 at 3:19 pm	and is filed under News & Updates. You can follow any responses to this entry through the RSS 2.0 feed. Responses are currently closed, but you can trackback from your own site.